WE HAVE AN AVAILABLE BLUE MERLE BOY! We are a small kennel located in the northern part of Serbia, with ambitions to breed quality border collies. What is quality in our opinion? 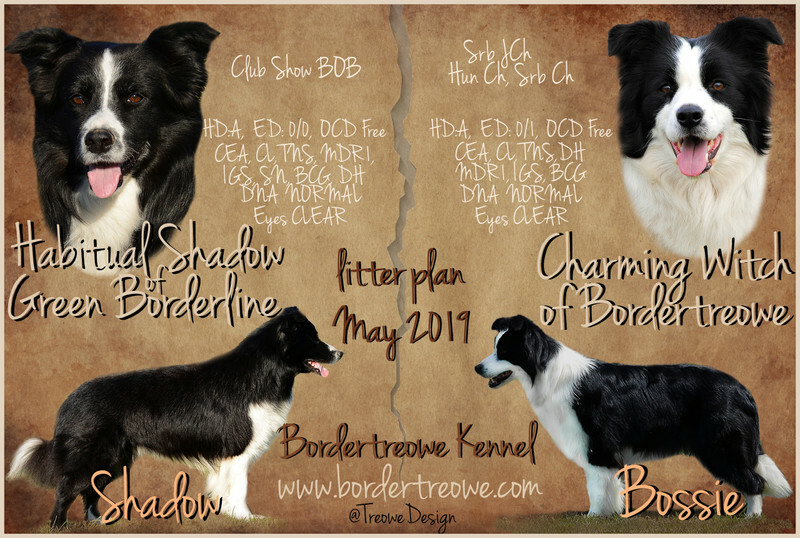 First of all it means health above everything, perfect temperament and character that makes the border collie a BORDER COLLIE, and we strive for combining all this with looks that can prove quality on conformation shows as well. We do not keep many dogs at home, because we think the dog itself is the most important, and being a border collie, this means regular care and training. We keep a few very promising youngsters in co-ownership, to keep the important bloodlines and if they end up with the qualities and health we need, they will be a part of our breeding program. All of our breeding dogs are health screened for all genetic diseases (DNA tested for CEA, CL, TNS, MDR1, IGS, BCG), x-rayed (for HD, ED, OD) and eye-tested (CEA, PRA, KAT, RD, GLA). Our offspring is sold only to active, responsible families that are wiling to stay in touch with the breeder even after taking the puppy home, because, as the breeders we feel responsible for Bordertreowe bred dogs for the rest of their lives!